The weekend 10th -12th February the seminar “Romanian Masterclass 2017” was held in Norway. Anca Wallmen Sensei and Harris Wallmen Sensei, Romanian elite instructors was invited to train, guide and inspire the NKO – Shin Norway. 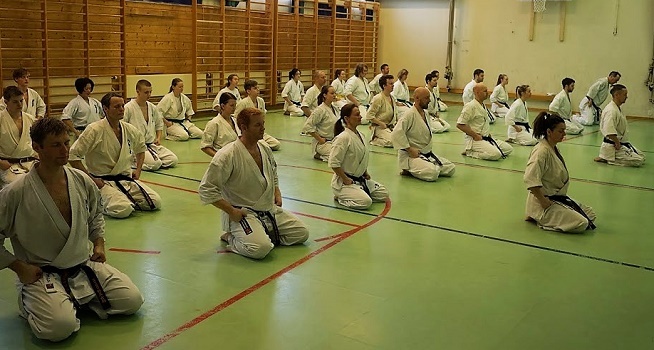 Some of the Norwegian Karatekas has been inspired from camps and seminars with these instructors, and the experience made an impression that this should be introduced to more Norwegians Karatekas. I nspired from Camp Banzai 2016, the Norwegian instructors who attended (and others) was motivated to get the Romanian instructors to Norway. After some communication, the date was set and the camp was a fact! The Norwegian organization wishes to lift the level, the top and in the width – the choice of instructors would have to suite this wish. Therefor the choice – and it could not have been better. The practitioners was leaded through a total package of training. The camp had over 70 athletes signed up, but during some sickness (and work) the total was mid 60 from all over Norway, and a good mix of fighters and Dojo operators. ⇑Brand Chief from North and East attended, national team members and the national team trainers. Several of the fighters had this as the “pre Scottish Open” camp as well, and of course – European Championship further out in the season. Anca and Harris Sensei`s do have a very total way of promoting their learning. Many experienced how the duo how they made the various exercises and techniques to a broader context, to tie it all together in the end. And exactly this was one of the biggest issue for many who were present. And no doubt this contributes to a much greater understanding of Karate – in total. And just this is something unusual for someone where one are used to working more isolated on the different themes. 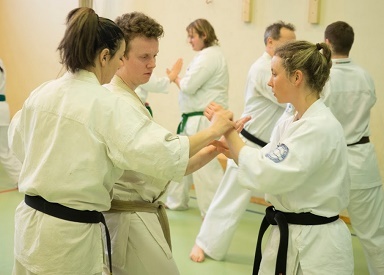 But it also requires a certain level to see the connections – or as in this case, really good instructors who can give examples, training drills and good explanations. Not even a strength exercise is done without a link to the technical and/or in to the coordinated aspect of body movement. The instructors gives a lesson in principles, and ideas of how it is possible to develop even if one have been training for a long time. Being two instructors, sharing their knowledge they also reach the whole group. Focusing on the same principles, but with different angle makes the whole class understand more, and in a deeper way. Peoples catch up in different ways, and one of the best solutions is to have good instructors that complement each other. Many drills and exercises pointed out how important the footwork was, combined with the understanding of distance and how to move through this. Adding techniques to it all really puts it`s all together. In these drills you also could feel what you for certain had to focus more on. The instructions did also have elements from other styles to clear out some good points and to make people see thing from an another side. The camp was with out a doubt a successes, and the interest of this was not getting any smaller! 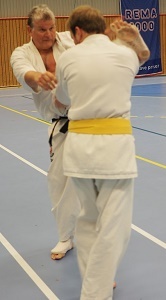 The Norwegian Karatekas went home from the camp with a great inspiration and a “bag” full of new ideas. We can only thank all who attended at the camp!